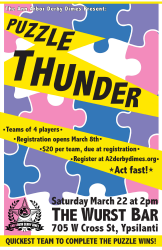 Put your puzzle piecing skills to the test in our next fundraiser, Puzzle Thunder! In this event happening Saturday, March 22, teams of four will race to the finish in assembling a 500-piece jigsaw puzzle. Do you have what it takes to face the thunder? Get more info in our events calendar, then register your team starting Saturday, March 8! Posted on March 2, 2014 by Ann Arbor Derby Dimes.